Would you like to easily find useful tips, tutorials and feedback? Then this is where you should be. 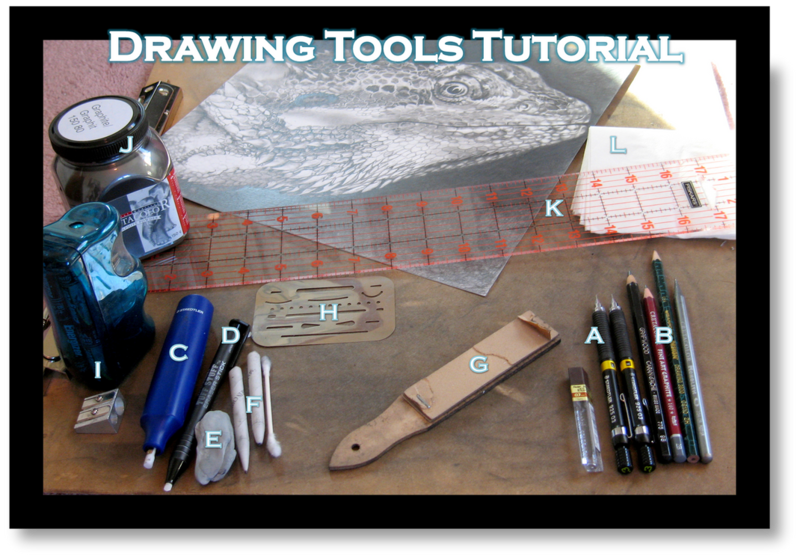 Here our Mentors will share with you their tips when it comes to pencil art! I found this tutorial by a stock artist who is providing great stocks to for example study different poses from. Perfect when you draw characters or just studying the human body. Check it out! This tutorial shows my simple method for starting pieces. It shows how I work from a photo reference and use a grid to achieve an accurate outline before working on any details or shading. I really think that being sure about having accurate linework will really improve an artist's confidence and enthusiasm for a piece. Realize that the line work is really one tenth of the actual time spent on a piece, most of the important work is in the shading and details, so pick a method that works the easiest for you! A: The pencils I use the most by far are my two .3mm mechanical pencils. One I keep loaded with the B Pentel Super Hi-Polymer lead .3mm lead, the other with HB. They are absolutely invaluable for getting small details, and pretty much the only pencil I'll use on something as detailed as the the WIP there. B: My other pencils, I've collected hundreds over the years in various degrees and brands, the only ones I really use are Cretacolor and Grafwood 2B, HB, 9B, and 2H. My very favorite is the woodless Cretacolor Monolith 9B. C: My Staedtler electic eraser. I was skeptical of this initially, but it quickly became an essential. It can be sharpened to a fine point very easily and erases small area clean without disturbing any surrounding graphite. Perfect for highlights. D: The Papermate Tuff Stuff stick eraser, also perfect for highlights, I sharpen it to a fine "V" with an exacto knife or sandpaper. It's ideal for hair and fur highlights. It also can create softer highlights than the electric as it doesn't erase clear to white as quickly. E: The ol' kneaded eraser is an essential. They're cheap, can be molded in any shape you might need, and have the power to lift graphite and lighten areas without necessarily erasing. F. My small smudging tools. I use tortillions for very small places and q-tips for larger small areas. I do not rely on these too heavily, I focus on building up good solid layers of graphite first and use the blending stumps just to smooth things a bit. H: That is an eraser shield that I occasionally use in conjunction with my electric eraser, it's good for super small dots and such. I: My Staedtler electic pencil sharpener, it works very efficiently and fast, I especially like it for woodless pencils. Also pictured is a little standard sharpener I use every once in a while. J: Creatacolor powdered graphite. I love powdered graphite primarily for backgrounds and very dark tones. I've found that when layered with my 9B it helps create very dark blacks, reduces graphite shine, and evens out any pencil strokes. It's good in large areas, I never really use it for anything precise. K: That's the 3" x 18" ruler I use for gridding, I like to make grids when I'm plotting my lines I find it helps me relax. I know many people use other methods, gridding is just my preference. L: Thick puffs tissue, no lotion of course, for blending large areas such as skin, initial layers of pencil, and background shading. One last note on paper, I love the 500 series bristol board, I've found it to be much, much smoother and more consistent than the 300 series. Mentors: When you've got something you would like to share here, just contact one of our admins by note and we can help you with the coding to get things right It's as simple as that! Here our Mentors will share with you their critique and feedback that they have given on works submitted in the ”critique”-folder. I'm sure the feedback is not only useful to those who have received it, but also for others who might have the same type of problem. This will be the place perfect for you who want to read useful tips and feedback. Mentors: To show your critique here, Note Lcutter with your critique that you want to publish here, together with a thumb link of the piece. But don't forget to ask the owner of the work before you send us a note, to make sure that it's ok that you show the critique here! I love helping other people out when I can, so it's not a problem. Having looked at the reference pic, I have a few ideas for you. First, the outline. As in the photo, people rarely have dark lines around them, so be careful when drawing a persons outline. It's amazing what the eye/brain can see without an outline. You just fill in the gaps naturally, so don't draw them in if the photo doesn't. Second, though you have a good sense of proportion and placement it does need a little work. Try using a grid on a couple of drawings (grid the photo, then your drawing paper and use the grid as a reference guide). After you get the placement spot on you'll get the hang of it and stop using the grid. I mention it because I see a few lines out of place, like her back at the bottom of the pic. In the pic, her back is almost straight down, while in your drawing it goes to the right. Try those tips out and hopefully they'll help you on your next one! Post up some following work, and if my suggestions didn't help maybe I can give you some others. After all, people don't all work the same way.